Has your shower seen better days? Refresh your current shower pan or shower base with All Bath Concepts' complete line of customized shower systems. Made of high quality, durable acrylic and covered by a Lifetime Worry-Free Warranty, your new shower will stand the test of time. Forget hard scrubbing, All Bath Concepts ensures that your shower will be easy to clean and maintain. Your new shower will stay cleaner in-between cleanings and will not mold or mildew like materials of the past. 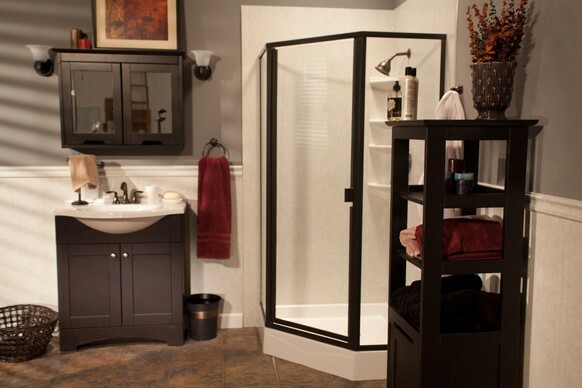 With a large choice of color & style selections your new shower will be functional, beautiful and cost effective. A Neo-Angle shower from All Bath Concepts is designed to nestle into a corner. Refresh your current neo angle shower with an easy to clean, durable, and luxurious new shower. Perfect for converting a small space into a shower, the Neo-Angle can fit into a space of 3-1/2 square feet.